He alleged that Modi government was giving 'more emphasis to the interests' of industrialists than to farmers who are not getting proper price for their produce. GUWAHATI: Social activist Anna Hazare today alleged that both the UPA and the NDA governments "weakened" the anti-corruption Lokpal Bill. He alleged that former prime minister Manmohan Singh "weakened" the Lokpal Bill (when it was framed during his tenure) and Narendra Modi "further weakened" the law by presenting an amendment in Parliament. A provision was made in the amendment that relatives of (government) officers including wife, children and others will not have to submit details of their property every year, Hazare claimed at a press conference here. He alleged that Modi government was giving "more emphasis to the interests" of industrialists than to farmers who are not getting proper price for their produce. Hazare demanded that farmers be given pension on attaining 60 years age on a priority basis rather than the government making other things such as GST a priority. 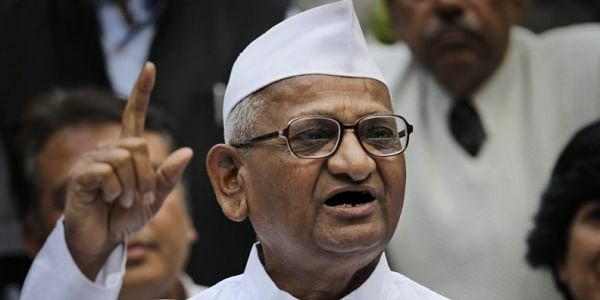 Hazare said a new movement against corruption would launched from March 23 across the country to pressurise the Central government to enact the stringent anti-corruption Lokpal Bill. To prevent participants from using his movements as spring boards to launch their own political careers, "This time volunteers will have to sign an affidavit stating they will not join any political party or float their own once they are part of this movement against corruption," he said.